Designed to alleviate fear and anxiety among children, the ASCEND Foundation has partnered with Sylvan Dell Publishing, to create the Cancer Companion Program. This childrens educational story book "Champ's Story: Dog's get Cancer too" along with stuffed golden retriever Champ, empower caregivers to discuss the issues of Cancer with Children in a meaningful and understandable method. Join us on The River Course, Kiawah Island, SC for a very special golf outting to benefit The ASCEND Foundation, A 501(c) (3) Charitable Organization. The River Course is one of the Top 100 residential courses in the U.S. In 2006, Tom Fazio extensively renovated his course from the original 1995 design. 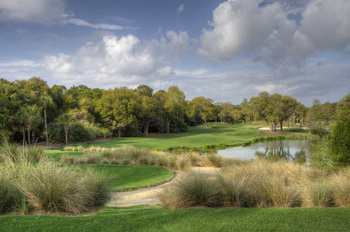 Play on a 7,039 yard tested course and enjoy eight holes along the Kiawah River and Bass Pond. The River Course has hosted The Kiawah Children’s Hospital Classic in 2000 & 2001. In 1996 Golf Digest listed the River Course one of the top five new private courses in the nation. In 2012 Golf Week Magazine named the River Course to its America’s Best Top 100 Residential Courses. ASCEND’s mission is to make ending cancer a national priority. We connect those touched by cancer into one voice to make a difference. Use our website to learn more about cancer, cancer statistics, cancer prevention, cancer research, news about cancer, and about what each of us can do to dramatically reduce the incidence of this unnecessary killer. If we want to beat cancer, we need to be PROACTIVE, rather than REACTIVE. Become a member of ASCEND's coalition. Please click here to learn more about 'CC'~The Cancer Companion, his story book, Champs Story, and how you can become a part in making this program a success.